A new study reports icebergs breaking off Antarctica caused rapid sea level rise 14,600 years ago. 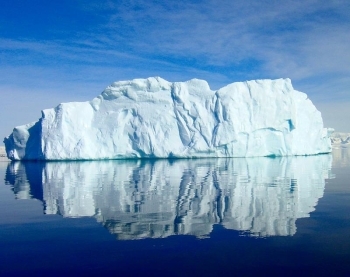 A study published May 28 in the journal Nature reports that the Antarctic icebergs may have caused rapid sea level increases. The researchers identify eight events of increased iceberg numbers from the Antarctic ice sheet, happening between 20,000 and 9,000 years ago. The largest influx of icebergs, which happened 14,600 years ago, resulted in a sea level rise of 6.5 feet over 100 years. The study provides the first direct evidence for historical, significant melting of the Antarctic ice sheet. Oregan State University climate scientist and study co-author Peter Clark says, "The Antarctic ice sheet had been considered to be fairly stable and kind of boring in how it retreated. This shows the ice sheet is much more dynamic and episodic, and contributes to rapid sea-level rise." The researchers used marine records of iceberg-rafted debris, various objects and sediments embedded in the ice that are deposited after the iceberg melts, to understand changes in Southern Hemisphere ice sheets. This technique has previously been widely used to understand variability in Northern Hemisphere ice sheets. Antarctica's glaciers have been shrinking since the end of the last great ice age, and the study reports that the last large release of icebergs was 9,000 years ago. Those melting events were caused by natural climate warming. Scientists have pointed to sea level rise as evidence for man-made climate change, and predicted future rapid melting of the ice sheet. However, these modern models had no documented historical events of rapid glacial retreat for comparison. Modern models of glacial retreat can now be compared to the historical behavior of the ice sheet provided by the study. The latest models of climate change and recent measurements of Antarctica's biggest glaciers predict rapid shrinking of the ice sheet and a rapid rise in sea levels. The current rate of sea level rise is measured at about 0.4 inches per year. Comparatively, the melting event 14,600 years ago resulted in a rise of approximately 0.8 inches per year over 100 years.